The quotation at the end of the first session is taken from the following section of Lewis Carroll’s ‘Through the Looking Glass’. ‘Does — the one — that wins — get the crown?’ she asked, as well as she could, for the run was putting her quite out of breath. ‘Dear me, no!’ said the King. ‘What an idea!’…………. There was a pause in the fight just then, and the Lion and the Unicorn sat down, panting, while the King called out ‘Ten minutes allowed for refreshments!’ Haigha and Hatta set to work at once, carrying round trays of white and brown bread. Alice took a piece to taste, but it was very dry. ‘I don’t think they’ll fight any more to-day,’ the King said to Hatta: ‘go and order the drums to begin.’ And Hatta went bounding away like a grasshopper……. At this moment the Unicorn sauntered by them, with his hands in his pockets. ‘I had the best of it this time!’ he said to the King, just glancing at him as he passed. 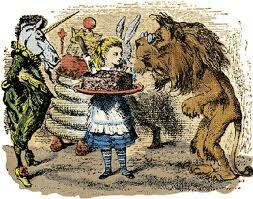 ‘It didn’t hurt him,’ the Unicorn said carelessly, and he was going on, when his eye happened to fall upon Alice: he turned round instantly, and stood for some time looking at her with an air of the deepest disgust.